Pulau Tioman or Tioman Island, selected by TIME magazine as one of the world’s most beautiful islands, is located 32km off the east coast of peninsular Malaysia, and is easily accessible by bus (RM22.80/$7.20, 4.5 hours) from Melaka via Mersing. The bus dropped us off outside the ferry ticketing office in Mersing where we bought our return tickets (RM35/$11 plus a RM5/$1.60 Conservation Charge payable at the dock) to the island. It was a pleasant and signposted walk to the Bluewater Express ferry terminal from the ticket office. The ferry schedule is different everyday as it has to follow the tides. The crossing took about one and a half hours to the first stop (Genting), and from there it was about 30 minutes to Air Batang. 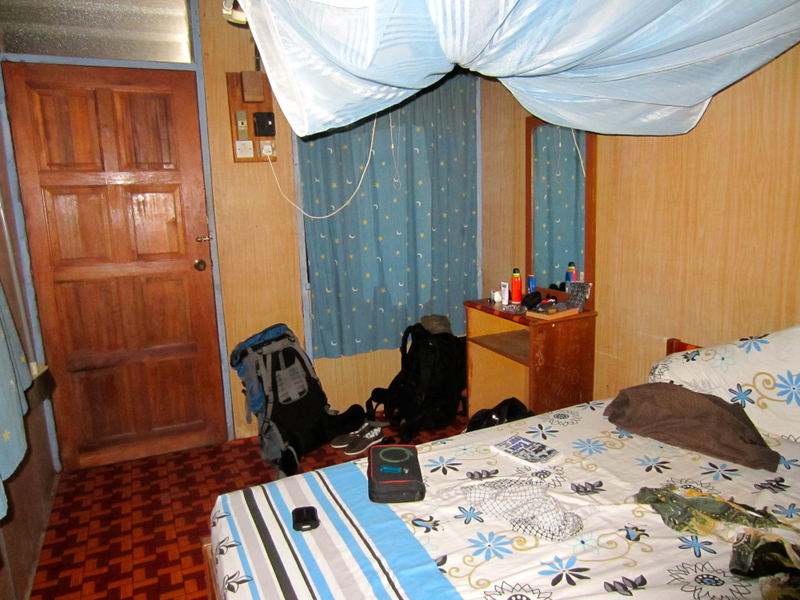 Our chalet had everything we needed: mosquito net, windows, a fan, and a private bathroom. Air Batang (also known as ABC) is a good choice for budget accommodation. We were a little nervous as we hadn’t booked ahead; but other than our first choice being full, many of the chalet places had open cabins (some of which were extremely basic and a little rough around the edges). We walked south from the ferry dock and stopped in at a place called YP Chalets. They were reasonably priced at RM40/$12.70 per night, and well positioned with a nice stretch of beach in front. Some of the chalets in ABC are located in stony beach areas which can make for a painful, albeit slightly comical looking, dash into the surf. We settled into our chalet, relaxed by the beach with some duty-free, happy hour beers, played cards and watched the sun go down. Air Batang’s beach is stony in places. 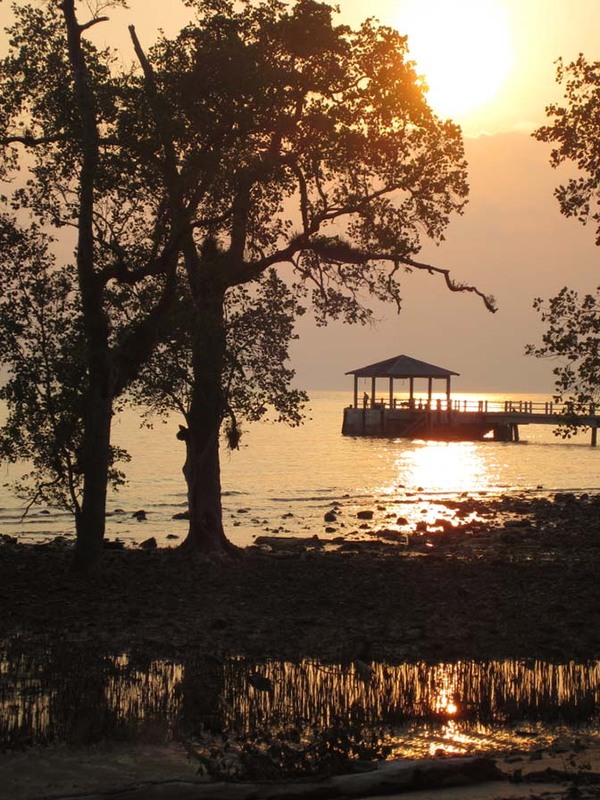 The sun sets on Tioman Island. The next morning, we were up bright and early to tackle a hike from ABC to Monkey Beach. We found a blog that described the route, and pointed out the best snorkeling spots. We followed the path north out of ABC and stopped along the way to rent a snorkel (RM10/$3). The hike took us (mainly up hill) past Panuba Resort along a trail carved out by power lines to Monkey Beach. The hike took us about 90 minutes, and to be honest, I felt like turning back and quitting several times. The weather was extremely hot and it was definitely more up hill than down on the way to Monkey Beach. However, the result was our own private beach with crystal clear water. We set our things down and walked into the cool, clear water and as we floated the exertion of the hike melted away. The walk back to town seemed easy in comparison. Although, if you don’t feel like walking, it is possible to take a water taxi between beaches. When we were at Monkey Beach, a water taxi driver offered us a ride back to ABC for RM50/$16. We declined, preferring to walk, and we made it back into town just in time to grab a late lunch at 4pm before the restaurants closed until dinner. The uphill struggle from ABC to Monkey Beach. Monkey Beach was totally empty the whole time we were there. Tioman Island was a beautiful place to spend 3 days. The beaches were lovely, the hiking was invigorating, and the snorkeling was good if you found the right spots. It was our final chance to feel the sand between our toes and fall asleep to the sound of waves before being thrown back into modernity in Singapore. We definitely made the most of it. Loosks like a nice trip, Keep your posts coming.